There is a well-known saying, ‘Going to church no more makes you a Christian, than sitting in a garage, makes you a car’. How true that is! And yet often we are surprised when we are disappointed by people we meet in church or if we feel our leaders have let us down. The church is God’s idea and we, as His people, are the ‘living stones’ of the church. And regardless of the circumstances, I believe it is important for each of us to be part of a church and to be part of the ‘assembly’ (as it says in Hebrews 10). No man is an island and we all need that sense of community and accountability. However, it is not always easy. In a perfect world, church should leave us feeling fulfilled and built up. Church should be a place where we go to meet with other like-minded believers, where we are free to worship and where we can hear from God and be made strong in His word. For me, personally, it is not about the style of the church or the type of worship, it is about the connection we make with God when we are there. Church should be a place where we become aware of God’s presence, where we can get encouraged and also corrected, if that is what we need. But for many, church is not like that and many people struggle within their church communities. 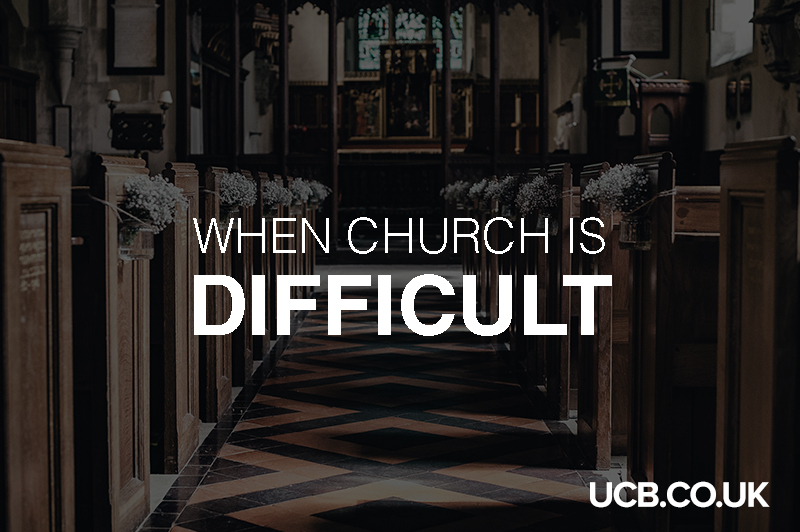 So how can we respond when church life is difficult? Personally, when dealing with difficult people and situations within church, I have always found it helpful to not point out flaws in the person, but to address the real issue, or in some cases, the spirit which is motivating the negative behaviour. For example in Acts 16, Paul and Silas were being followed by a woman who kept shouting, ‘these are men of God, they will show you the way to salvation’. That might not sound like a bad thing, but Paul identified there was a spirit at work. Instead of addressing the woman or the personality, he addressed the spirit of fortune-telling which was motivating this woman and commanded it to leave. He saw the situation through his spiritual eyes, not his natural eyes. It can be easy to react to negativity, but we should always first of all, commit to prayer. Sometimes, there are no ‘quick fixes’ for awkward situations or conflict, but we should always commit to covering the whole situation (for however long it takes) in prayer. I was in situation many years ago and a pastor approached me about a difficult couple in his church. ‘What should we do, David? he asked. It would have been very easy to give my opinion, but the truth is, it is not my opinion which counts, but the opinion of the Word of God. What does God’s Word say? I believe if we ask God for a revelation and an answer, He will always give us a strategy or shine a light on a piece of Scripture which will give us hope for the future. You might be in a situation where you feel you have tried everything but there is no clear way forward. If that is the case, perhaps God has a different church community for you to be part of? If you feel it is time to move on, then it is important to ‘leave well’. Pastoring a church is a difficult job and for many ministers, it can be a lonely experience. When a person leaves a church, as a pastor, it is difficult to not take it personally. So, if you are leaving, try to take everyone’s feelings into consideration and don’t slam the door on your way out. Instead, do all you can to leave with a right attitude and on good terms. If you are looking for a new spiritual home, the key questions to ask yourself are; ‘Do I fit in here?’ ‘Do I feel at home?’ What is their vision? Is it something I can give my heart, time and talents to? Are the leaders really called to the mission/vision of the church? Can I support their vision? And finally, is it a place where I can grow? It’s important for all of us, to be part of a church community which enables us to grow spiritually and practically, but also to be encouraged and strengthened in God’s Word. Ask God to guide you to the right church home. He won’t let you down. What can you do if the leadership ignore you, even if you have been through similar difficult circumstances to them? Yet, they give over and above the support for some members of the congregation, yet absolutely none whatever for you? Also, some say you should forgive & forget, yet we are looking for support, the same as we try to give to others. What I find hardest in Church is the level of unforgiveness that exists when people stop talking and communicating. What do you do when you are ignored as a single women in the Church? When the outreach and events are aimed at families, married couples, Who let the Dad’s out etc? Hi Donna. Do you feel you could point out to your leadership that they gave help and support to (name) and that you are also in need of the same support? By reminding them of their brotherly love for others it might prompt them to do the same for you. Very good and very true, speaking as a pastor.